When the executive board of the International Olympic Committee announced in St. Petersburg, Russia, today that wrestling would remain in the running to earn at least provisional sport status for two Olympics after 2016, there were smiles among many in USA Wrestling. But these leaders, some of which were former wrestlers themselves at the highest levels of international wrestling, all know that reaching their final goal — of keeping wrestling as a core Olympic sport — has a long way to go before the IOC Congress meets in Buenos Aires, Argentina, Sept. 7-10, to determine the fate of wrestling in the Olympics. “I feel like I did when I wrestled and won a semifinal match after being well prepared. Now we have to get ready for the finals,” said Stan Dziedzic, a former Olympic medalist and a ranking member of FILA, the international governing body which oversees international wrestling and has made radical changes since February when the IOC’s executive board announced that wrestling was not going to be included among the Olympics’ 25 core sports after the 2016 Games in Rio. 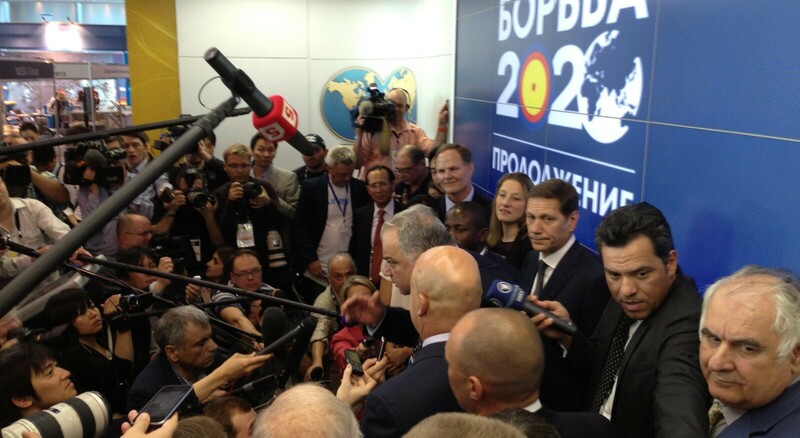 America’s Jim Scherr (standing above FILA president Nenad Lalovic speaking to media members in Russia) was among five who appeared before the IOC’s executive board on May 29. “We had a very favorable outcome but this is only the first step,” said Jim Scherr, the former World silver medalist and the former chief executive of the United States Olympic Committee, who was one of five people representing FILA; one of eight sports requesting to be considered a provisional sport in the 2020 and 2024 Games. Will that make it even tougher for USA Wrestling leaders to galvanize Americans to support wrestling — an original Olympic sport — over baseball, once called “America’s pastime”? Also, the question of wrestling becoming a provisional sport could be a moot point, based on an earlier vote that will be taken by 101 IOC members in Buenos Aires in September. “There are two votes that will happen in Buenos Aires at the IOC general assembly,” said Scherr. “The first vote will be to ratify the IOC recommendation of the 25 core sports. Wrestling is not one of those 25 recommended sports. “If that vote is not ratified, wrestling could remain as a core sport. In addition to naming Serbian businessman Nenad Lalovic as its new president, FILA also has changed up its board and the sport’s rules. Some former female wrestlers are now on its board. And the most notable of the rules changes is that a pair of three-minute periods and a cumulative score will now determine matches. The leadership feels this will only help in making the sport more fan and TV-friendly. “The new rule changes have created more activity, more excitement and more scoring,” said Scherr. “We believe the new rules will remove passivity and stalling in wrestling. Wrestlers will determine the outcome of the match, rather than an (overtime-deciding) ball pull. Scherr also believes FILA is answering the gender equity problem that existed under the leadership of former long-time FILA president Raphael Martinetti, who resigned in February. Scherr also pointed out that FILA will recommend adding two women’s weights to the current four weights. This will be finalized later. And their proposal would likely be structured where those additional two weights are removed from men’s freestyle and Greco-Roman, dropping the number of weights in those styles from seven to six. All the leaders of USA Wrestling believe that the spirit of wrestling fits the ideal of the International Olympic Committee. “We need to show the merits of our sport to the rest of the world and not attack our competition,” said Dziedzic. “The fact that two wrestlers of equal size with nothing but the wit and their will determines who’s best.